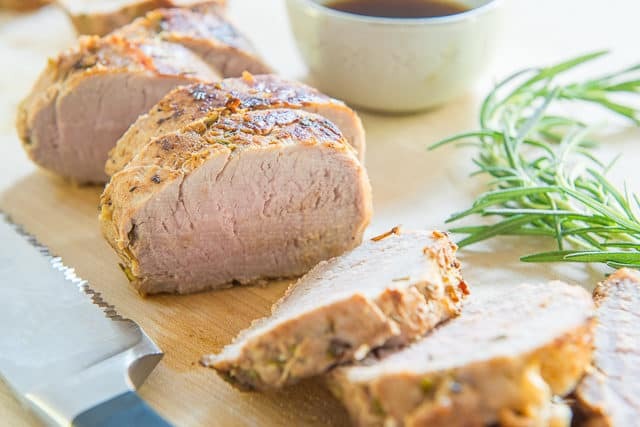 This Pork Tenderloin Marinade is made with fresh and bright flavors like lemon, garlic, and rosemary. It has a Mediterranean spirit, and only takes a few minutes to make! It’s amazing how much flavor 5 ingredients can bring to a dish. Everything in this marinade is completely accessible and easy to put together, but covers quite a few flavor notes and aromas. This marinade is reminiscent of a classic Greek Pork Souvlaki, but with a few subtle changes. First, rosemary is the star herb, instead of oregano. 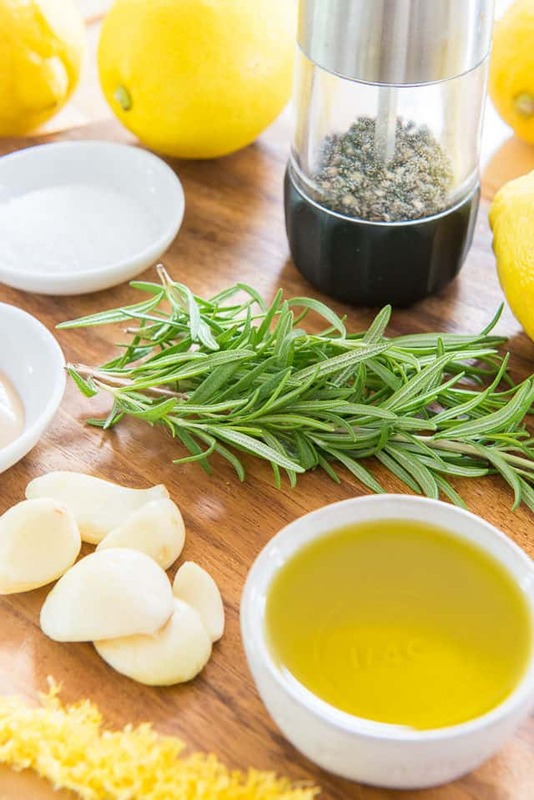 Rosemary is my favorite herb flavor affinity with pork, and it works so well with the garlic and lemon. 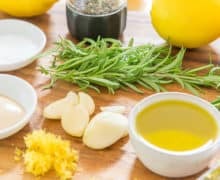 I also go a bit stronger with the lemon here, both in the ratio of lemon juice to olive oil that’s typical in a marinade, and adding the incredibly aromatic and flavorful lemon zest to the mix. A touch of Dijon mustard also helps emulsify the ingredients and brings in another of pork’s strongest flavor affinities. Ideally it’s best to marinade this pork for a couple hours, but you can also let it go overnight. The marinade is not so acidic that the pork risks going mealy. 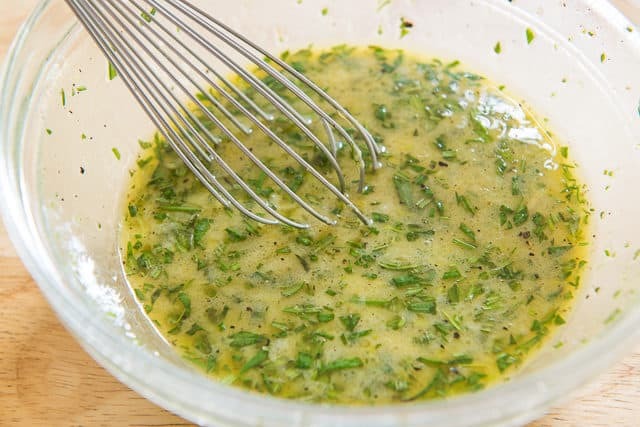 And as far as actually making the marinade, it only takes about 5 minutes. Easy, easy! This is one of those instances where you want to use a great quality extra virgin olive oil, and not the refined and flavorless stuff. I like both California Olive Ranch and Trader Joe’s Kalamata olive oil. 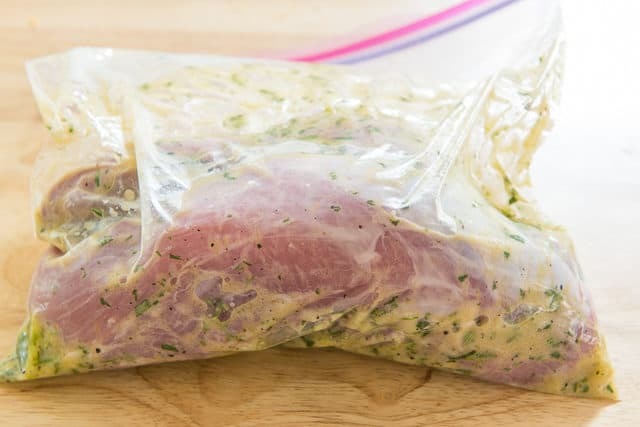 I like to place the marinade in a zip top bag with two pork tenderloin pieces, and pop it into the fridge for a couple hours. Then I cook the pork tenderloin using this Roasted Pork Tenderloin method, but you could also throw it on the grill. For other pork marinades, you can use the same marinades as this Chipotle Shrimp (marinate for 2 hours), or this Korean Kalbi Beef (marinate for 2 hours as well). Pork tenderloin takes well to so many different flavor themes. Enjoy! 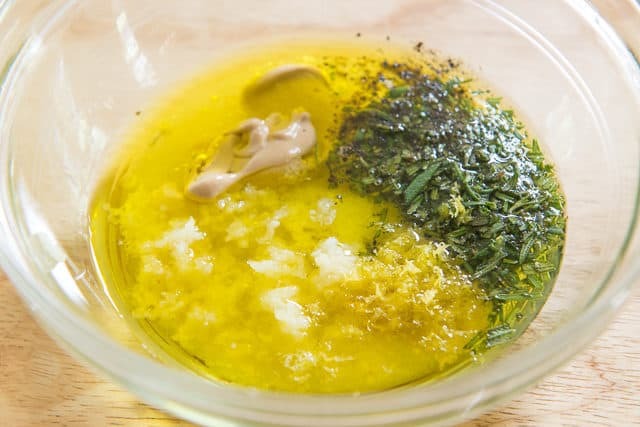 This delicious Pork Tenderloin Marinade has a Mediterranean spirit, with olive oil, lemon, and garlic. It only takes a few minutes to make! Place all ingredients in a bowl, and whisk to combine. The marinade is now ready to be used. I find it's the optimal amount for 2 standard pork tenderloins (about 2.5 pounds total). Place the marinade and pork in a zip top bag for about 2 hours**. Remove the pork from the marinade, then cook as desired. I like to make Roasted Pork Tenderloin, but you can also grill the pork. Enjoy! 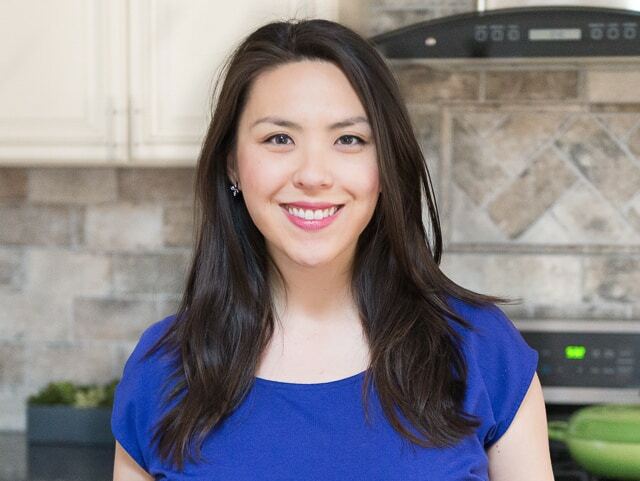 *I still add an additional sprinkle of salt to the outside of the pork before I cook it. **The pork can marinate overnight as well. I have found that the marinade is not acidic enough that the pork risks getting mushy, even after an overnight marinade. Made this tonight and the flavor was superb. Great balance. I absolutely love this recipe. Thank you for sharing. Can this pork and marinade be frozen? Do you mean before or after cooking? The short answer is probably yes, but I’m curious at what stage you’re freezing.